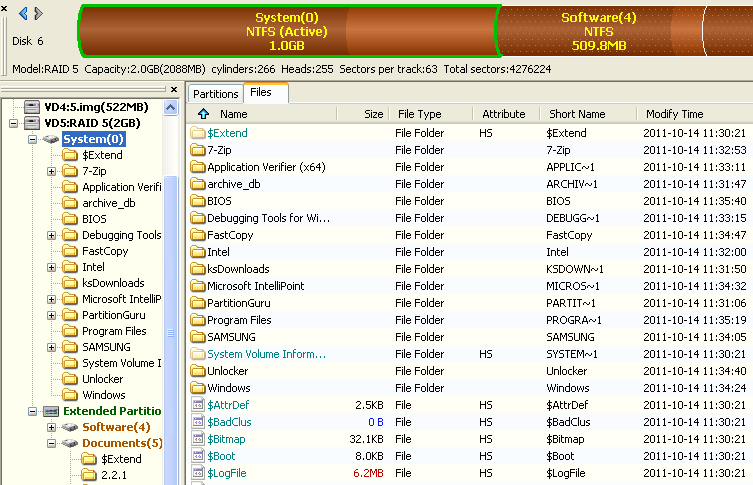 PartitionGuru can recover data from software volume sets and RAIDs. If a software volume set or RAID is present in your system, it will be displayed on the left panel of PartitionGuru. 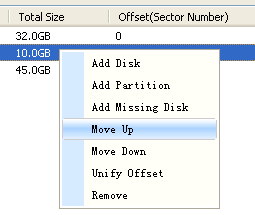 This object can be searched for files or partitions the same way as from normal drives/volumes. If, due to hardware failure, a hardware volume set or RAID cannot be accessed, or due to data loss your system does not recognize a software volume set or RAID, and you know what hard drives were in it, you may construct a virtual RAID and process it like a real software volume set or RAID. Click “OK” button, the virtual RAID will be displayed like a general hard drive. If the partition table and file system structure of the RAID are not destroyed, all partitions and files also will be displayed immediately. Now you can copy out the files, or recover the lost partitions and files as if it’s a general hard disk. The virtual RAID is read only and you can create temporary partition for recovering files but can not save the partition to the virtual RAID. 1. Select the virtual RAID. 2. Click the “Tools” menu and then select “Recompose Virtual RAID”. 3. Correct the settings from “Construct Virtual RAID” dialog box. This entry was posted in Partition Manager and tagged construct virtual raid, PartitionGuru, raid data recovery, raid recovery software by EASSOS. Bookmark the permalink.